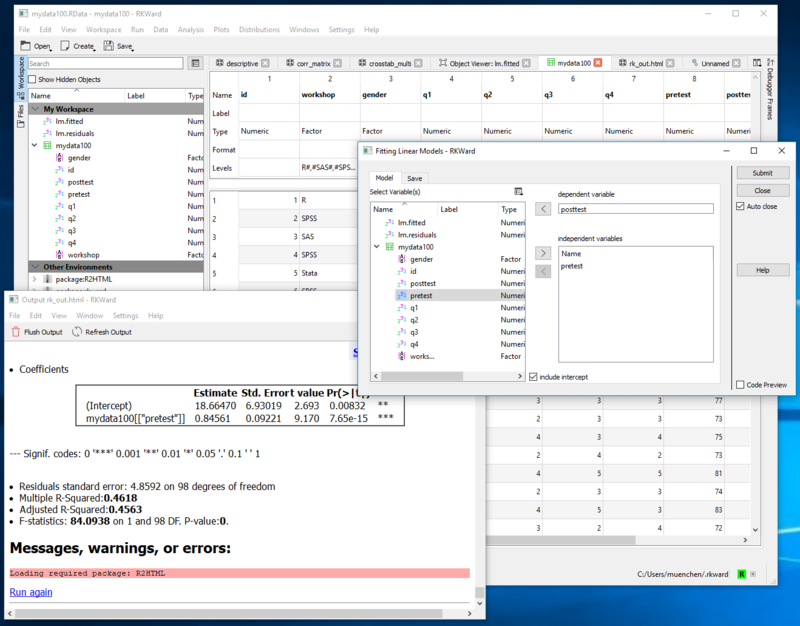 RKWard is a free and open source Graphical User Interface for the R software, one that supports beginners looking to point-and-click their way through analyses, as well as advanced programmers. You can think of it as a blend of the menus and dialog boxes that R Commander offers combined with the programming support that RStudio provides. RKWard is available on Windows, Mac, and Linux. This review is one of a series which aims to help non-programmers choose the Graphical User Interface (GUI) that is best for them. However, I do include a cursory overview of how RKWard helps you work with code. In most sections, I’ll begin with a brief description of the topic’s functionality and how GUIs differ in implementing it. Then I’ll cover how RKWard does it. Figure 1. RKWard’s main control screen containing an open data editor window (big one), an open dialog box (right) and its output window (lower left). GUI = Graphical User Interface specifically using menus and dialog boxes to avoid having to type programming code. I do not include any assistance for programming in this definition. So GUI users are people who prefer using a GUI to perform their analyses. They often don’t have the time required to become good programmers. IDE = Integrated Development Environment which helps programmers write code. I do not include point-and-click style menus and dialog boxes when using this term. IDE users are people who prefer to write R code to perform their analyses. The various user interfaces available for R differ quite a lot in how they’re installed. Some, such as jamovi or BlueSky Statistics, install in a single step. Others install in multiple steps, such as R Commander and Deducer. Advanced computer users often don’t appreciate how lost beginners can become while attempting even a single-step installation. I work at the University of Tennessee, and our HelpDesk is flooded with such calls at the beginning of each semester! Installing RKWard on Windows is done in a single step since its installation file contains both R and RKWard. However, Mac and Linux users have a two-step process, installing R first, then download RKWard which links up to the most recent version of R that it finds. Regardless of their operating system, RKWard users never need to learn how to start R, then execute the install.packages function, and then load a library. Installers for all three operating systems are available here. The RKWard installer obtains the appropriate version of R, simplifying the installation and ensuring complete compatibility. However, if you already had a copy of R installed, depending on its version, you could end up with a second copy. RKWard minimizes the size of its download by waiting to install some R packages until you actually try to use them for the first time. Then it prompts you, offering default settings that will get the package you need. On Windows, the installation file is 136 megabytes in size. When choosing a GUI, one of the most fundamental questions is: what can it do for you? What the initial software installation of each GUI gets you is covered in the Graphics, Analysis, and Modeling section of this series of articles. Regardless of what comes built-in, it’s good to know how active the development community is. They contribute “plug-ins” which add new menus and dialog boxes to the GUI. This level of activity ranges from very low (RKWard, BlueSky, Deducer) through moderate (jamovi) to very active (R Commander). Currently all plug-ins are included with the initial installation. You can see them using the menu selection Settings> Configure Packages> Manage RKWard Plugins. There are only brief descriptions of what they do, but once installed, you can access the help files with a single click. RKWard add-on modules are part of standard R packages and are distributed on CRAN. Their package descriptions include a field labeled, “enhances: rkward”. You can sort packages by that field in RKWard’s package installation dialog where they are displayed with the RKWard icon. To leave a comment for the author, please follow the link and comment on their blog: R – r4stats.com.